I'm not actually sure if this is a pinafore dress, but it's what I'm calling it in my head, so it's good enough. Anyway, the inspiration for this came from me hanging around outside the changing rooms in Oasis (UK high street shop) while my sister was trying something on. I saw a lovely brown needlecord pinafore dress, and thought the good old sewist thought of "I could make that!". The little red bit beside my hand is the light from the camera clicker - and it took me a minute to work that out! And as winter has well and truly kicked in, we're going with inside photos. The pattern is self-drafted, and while the idea was rattling around my head I recalled this dress from a couple of winters' ago, so used the pattern from it. Turns out I had trouble deciding what to call that style of dress too! The only thing I changed was to add pockets. My fabric is some burgundy needlecord from My Fabrics. It's not easy to see in the photo below of the Oasis dress, but the front of the dress is cut on the cross-grain. I fancied trying this, but stupidly only order 1.5 metres, so everything was cut on the straight grain. and also this snazzy exposed zip. I used this tutorial from Megan Nielsen, but I don't love the bottom of my zip. It got un-picked about five times, and broke one needle. The inside of the lining is hand-stitched to the back of the zip. So far, so good. It started going down hill with the lining... The lining fabric is some random animal print poly from the interwebs. Friends, this stuff is the fabric equivalent of the Weeping Angels from Doctor Who - you blink, it does something nasty. Mostly unravelling. And, of course, the fraying thread stuck to the needlecord like glue. Sigh. You can see how much it's fraying in this photo above, so just admire my rolled hem instead! I thought taking the pinking shears to the lining seams would do the trick - turns out I was wrong. I fully expect the lining to fall apart fairly swiftly, so had the wit to not trim the neck and armhole seam allowances, so I can re-line it at some point. The rest of this fabric is already in the recycling! The hem was done with the blind hem foot and stitch on my machine, and this is my new favourite thing. Here's how it looks from the right side, including bonus fluff from the lining. And this is the wrong side. Other than the nasty lining, I love how this turned out, although I want to wear it a few times before I decide if I want to tweak the fit a little bit. I already have another version planned in tartan. What a lovely dress Lynne. It looks fabulous on you. I really like the shape, the colour, the fabulous pockets! It must have been frustrating to work with the fraying lining but the finished dress looks well worth it. I hope you enjoy wearing it lots. Just wanted to mention also that I've finished making my winter coat inspired by your post and using the same fabric that you used. It was my first proper coat and has turned out pretty well. I've worn it a few times already. Thanks again for the inspiration and helpful technical details. Best wishes. Elaine. Hi Elaine! Thank you for your lovely comments! Congratulations on making your coat, and I'm so glad I was able to inspire you. It's definitely coat weather now, and I've been wearing mine a lot. Are you on Instagram or do you have a blog? I'd love to see some photos of your coat. Thank you Lynne. I don't have a blog or Instagram although I should start one shouldn't I? So sorry I can't show you the coat as I'd love to show it off! The one bit that I'm not so happy with is the insides of the bound buttonholes as I used black fusible interfacing to back the little windows then ironed it down but it shows a little bit. Otherwise it's not bad. The collar got basted in twice as I didn't get it centralised the first time and the hem took two attempts and is now hanging well as I've done as you suggested and kept the lining separate. My sleeves look ok now but took a bit of readjusting as my tailor tacks fell out and chalk marking just rubbed off!! At least the in seam pockets are right this time. My last jacket has no pockets as they went so wrong! I do have a lot to learn as I've only been sewing a couple of years and the online sewing blogs have been indispensable to me. Instagram is amazing for sewing, I can highly recommend it. It's definitely worth basting on a coat, especially as you can re-do if it doesn't look right. I had to do my hem twice too, and will be doing my hems with a loose lining from now on - it was so much easier! Good luck with your sewing, the on-line sewing community is such a brilliant resource. 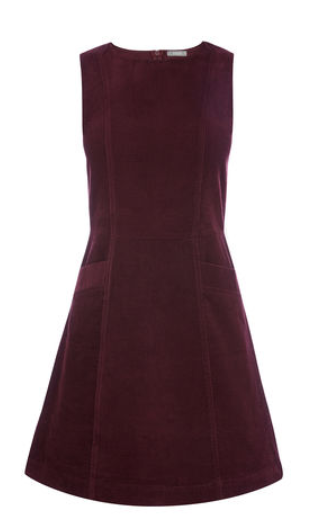 What a pretty pinafore! ( And, you got that right.). It looks super cozy and warm. I hate being cold, and am now thinking about making something similar. Thanks for the ideas! Thank you! I've been wearing this today, and it's toasty warm with woolly tights. I would call it a pinafore too because you're wearing a top underneath it! I would have got very frustrated with the lining and ripped it to pieces! I'd definitely call it a pinafore! And it looks great, I especially like the pockets. It's a shame that the lining caused you hassle, but at least you can't see any of that from the outside! Thanks Ruth! I think the pockets are the best bit!